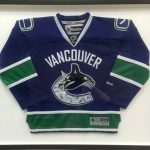 At Gallery 88 Arts and Custom Framing, another challenge we often face, is how to take something that is fairly small, and present it in such a way that it looks more important and valuable, without show casing the framing and overshadowing the memento or keepsake. 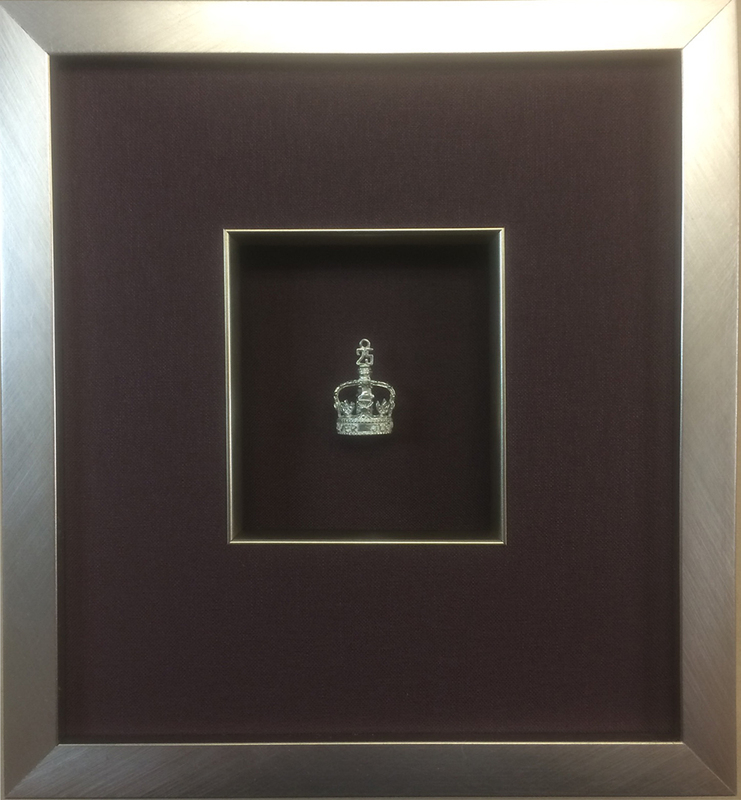 We recently had to frame a small crown charm that was a memento of the twenty fifth (Silver) anniversary of the Coronation of Queen Elizabeth ll. We decided to use a dark mauve linen mat with a silver fillet and frame that matched the colour of the charm as closely as possible. Rather than place the bottom of the crown on the mat, we decided to spot stitch the crown on its side, to best display its shape and relief. We shadow boxed the crown a comfortable distance from its height and brought a second mat on top – then one inch from the crown we used the silver fillet, covering the bevel, to contrast and being a larger presence to the crown. The value of the contrast between the mat and the crown, the fillet and the frame was quietly profound. We kept the framing very simple, as not to compete with the frills of the crown. As you can see the overall presentation was not too big but big enough to give the crown an heirloom presence that would only grow in sentimental value. Again, we used Ultra Glass to cut down on reflection and enhance the clarity of the crown, especially its depth and highlight the supporting texture of the linen mat. We feel that the overall effect was very special. The customer was also very pleased with the overall presentation. Go to the Queen Elizabeth II website.